OOTD - Striped Maxi Skirt | La Petite Noob | A Toronto-Based Fashion and Lifestyle Blog. Here we are, approaching the end of April and it's cold - not face stinging cold but rather cold enough that shorts, tanks and summer dresses seem like a distant future. This striped maxi skirt may be the only skirt I will be wearing for while, but paired with a thin black sweater and large brimmed hat it is fun enough to curb my summer cravings. The entire combination had me immediately nostalgic for Paris. Even though the outfit is a far cry from what Parisians actually wear (more about that here), but the glamorised Paris in my head sees everyone in a large brimmed hat, over sized sunglasses and bold lips. Read on for additional photos and outfit details. This wide brim hat was a great Marshall's find from years ago, but now I'm seeing them everywhere in countless retail stores. 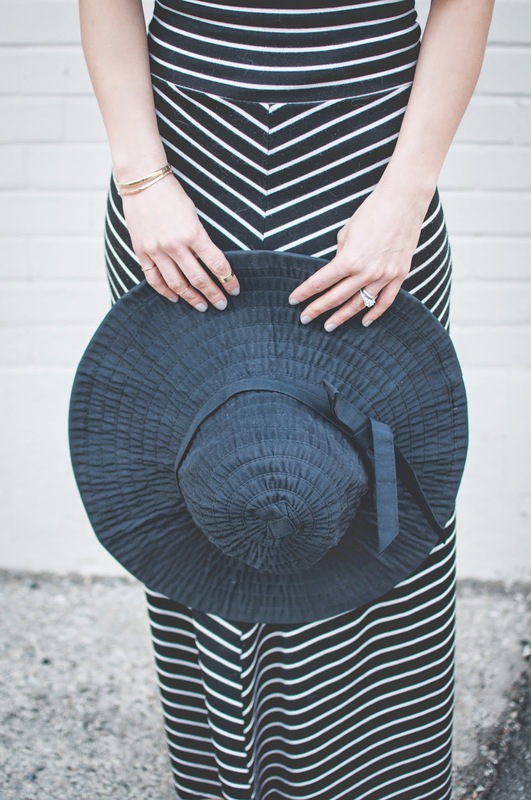 My only caution when purchasing a large, floppy hat of your own (especially if planning to wear it at the beach) - opt for one with ventilation throughout, whether it be made of straw or any other porous material. This particular hat is completely solid and, while it it great for keeping the sun out of your eyes, it is very susceptible to wind - one large gust and this hat takes on the properties of a Frisbee. Take it from me - I've had to sprint embarrassingly down the beach one too many times trying to retrieve my chapeau. This skirt was also purchased last summer after months of scouring every store for the perfect striped maxi skirt - now it seems as though you can find one anywhere! The material is just heavy enough wear comfortably during chilly weather, and also makes it a perfect option for a crisp summer night. How is everyone coping with the cool spring we've been having? I would love to know! love the hat and bold lip combo you gorgeous girl. I'm just wearing sweaters with skirts or shorts haha I can't take it anymore! I think I'm going to take a page from your book and also start wearing my shorts with a sweater - I've had it! So good to talk to a fellow Toronto-area blogger who feels my pain, haha! You look perfect and tres chic! You're transporting me back to Paris - I'm loving the maxi skirt, girl. Thank you! I love your first Paris post, and am anxiously awaiting more photos to be posted!